Coll. No. 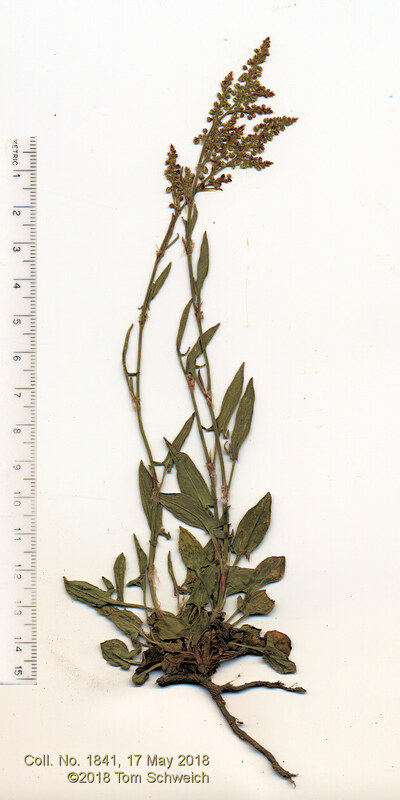 1841, 17 May 2018, characters observed: Perennial herb from woody rootstock, to 30 cm., dioecious (all plants in this collection staminate); Leaves, basal and cauline similar, ocrea, 7-10 mm., petiole 20 mm. + blade 12-24 mm. × 6 mm. wide, base hastate, lobes pointing outward, tip acuminate; Pedicels, 1-3 mm. ; Flowers, bulbar-like base, described as stipe-like, but does not look stipe-like such as that seen in Eriogonum umbellatum; Pedicels, 1-3 mm. ; Tepals, #6, 1.7 mm., reddish. Field Notes: Coll. No. 1841, 17 May 2018. Other photos about Species - Polygonaceae or Rumex acetosella.